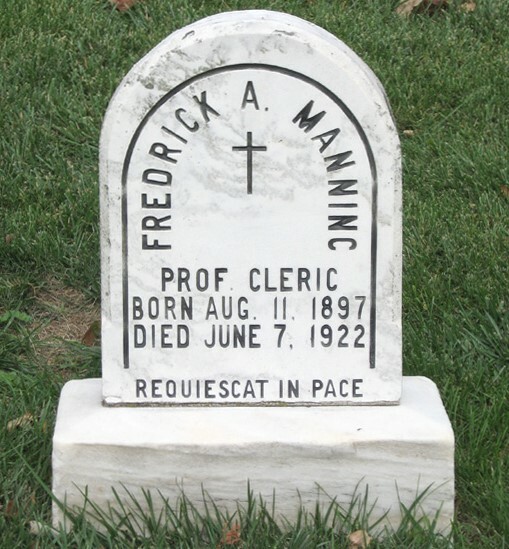 Frederick Aloysius Manning was born in Trenton, New Jersey, on August 11, 1897, and was baptized there at St. Joseph Church on August 22. He was one of three sons and three daughters of Martin Manning and Laura Dorety. One of the daughters became a Sister of Mercy and another a Sister of Charity. Upon graduation from St. Mary’s Cathedral School in Trenton, Frederick entered the novitiate at Villanova, PA in 1917, and professed simple vows on July 23, 1918 before Father Nicholas Vasey, O.S.A. He professed solemn vows on July 23, 1921. He was 25 when he died in Bryn Mawr Hospital on June 7, 1922, the day before Villanova’s commencement. Several weeks previously, on May 15, he had been bitten on the lip by a dog whom he had befriended while out walking with another professed student in Bryn Mawr. He returned home and the following day saw a physician. Days passed before he became violently ill as a victim of rabies. He had almost completed his education and preparation for priesthood. A funeral Mass was offered on Friday, June 9, 1922 at the Villanova Church, after which he was buried in the Community Cemetery at Villanova. Newer Post Aurelio Marini, O.S.A. Older Post John C. Maloney, O.S.A.